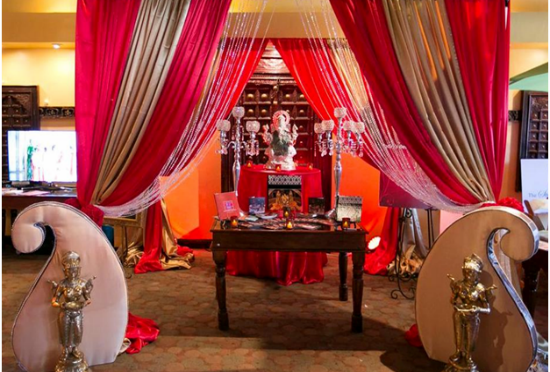 Vivah Lounge – the Bay Area’s premier south Asian wedding and productions resource center – held an exclusive expo for its vendors on December 8th 2013 at Madhuban Indian Cuisine in Sunnyvale. All vendors had displayed their products and services spread throughout the restaurant. This event was held primarily for potential clients who were interested in our services for their upcoming productions. Attendees were able to talk face-to-face with vendors, see their work up close, and have more personal attention rather than at larger expos. Other vendors such as Creative Vision Studios took extravagant photos of this event; Absolute Vibez provided lighting and music all throughout the day; Vama Designs set up a variety of bridal wear and provided apparel for models to walk about wearing them. M-Sutra Bride and Singar Studio showed their excellent services by doing hair and makeup for the models – Roop Bridal brought in clients for makeup trials. Our attendees appreciated the fact that we were not just standing at tables waiting around, rather we had taken a different approach and showed them what it is we actually do. Kaustubha showcased beautiful jewelry, from traditional to high fashion. Vivah Celebrations displayed a wide variety of wedding invitations, favors, and many wonderful Indian products that give that perfect touch to any event. Misha’s Cakery had a delicious setup of cupcakes to taste and cake designs for attendees to take a look at. Neeta of Mehndi Designer applied mehndi for guests, showing her extraordinary skills. Below, the Vivah Lounge team. All in all, this was an extravagant event –on behalf of Vivah Lounge, we would like to thank Madhuban for their time, restaurant space, and fabulous food!